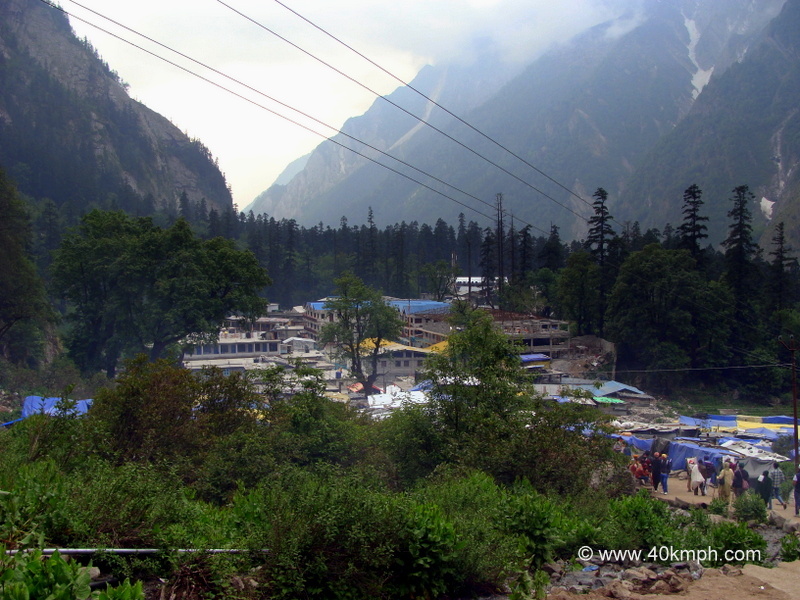 How much Time I took to Trek from Govindghat to Ghangaria? Ghangaria village is 13 km (trek) from Govindghat, Chamoli, Uttarakhand. We started our journey from Joshimath to Govindghat at 10:15 am via sharing jeep. By 11 am we reached Govindghat. 11:30 we started our trek from Govindghat to Ghangaria. First we stop at a counter just before the iron bridge over Alaknanda river to hire Kandi wala services to carry luggage bag. Rs. 605/- I paid. The bridge itself is beauty to watch. The moment we cross the bridge the display board talks about the distance which is 13 km. Initial trek of one hour is stony, steep and mostly with iron railings and then a relaxed comfortable cemented path to walk next to Hem Ganga holy river. The scenery around cannot be describe in words. One should visit to experience. There are various display board talking about village distance, poem praising God and nature, Valley of Flowers, way to Kagbhushandi, quotes and about NGO. 2 pm we were at Jungle Chatti. Govindghat to Jungle Chatti is 5 km approx. We were hungry. I order for two Maggi noodles for 3 person and two bottles of mineral water. Total amount I paid – Rs. 180/- (Rs. 100 for Maggie and Rs. 80 for two water bottle). Here I realized the word – costly. 2:45 pm we re-started our trek from Jungle Chatti. On the way around 4 pm we saw a tent for trekkers interested in foot massage. We stop a little but as there were too many trekkers in line for foot massage we decided to walk. 5 pm we were standing under a snow arch for our photography skills. Last few km is again steep and by that time I was very tired. 7:22 pm we were nearby Helipad and at 7:45 pm we reached Ghangaria. In short a thoroughly fantastic, clean well-maintained trek alongside Hem Ganga holy river. 13 km completed. Next day Ghangaria Hemkund trek i.e., 6 km. Total Trek Time from Govindghat to Ghangaria was 8 hours approx. including break-time. Note: It is important to share return journey time. While returning from Ghangaria to Govindghat we started our journey at 6 am. We were unaware of a river flowing below a bridge so I ask about the same to a makeshift stall owner. He was also unaware and I question another. Pushpawati river – He said. Upon further query about the current location he said – Kuwan pul (pul is bridge). Thank you – said I and we continue our journey. Nearby we saw Relax & Eat restaurant. We stop for breakfast. We had aaloo paratha (Rs. 35) and tea (Rs. 15). The rate varies a little I realized. High altitude makeshift shops including restaurants are costly and reason is: to reach ration, gas etc. one has to pay to mule owners for mule services and kandi wala services. Anyway, by 8:25 am we have completed 5 km downwards journey. Easy it was for sure. In between the journey we saw few pilgrims collecting fruits of a shrub. Upon query they enhanced our knowledge by saying, it is used as medicine for body pain. Tatela fruit is the name. First it is dried and crushed to make powder. Later powder is mixed with mustard oil to apply for body pain. Knowledge enhanced. Thank you – said I. Little more walking. Kandi wala started plucking yellow color fruits. Ainselu – He said but I known it is Hinsar wild berries. What he is saying is a common name. 12 noon we reached Govindghat and stayed in Gurudwara for a night. I was happy about the entire trek. Total Trek Time from Ghangaria to Govindghat was 6 hours approx. including break-time.